So I have decided to start doing Throwback Thurdays and pick an older digital stamp to feature for $2.00! 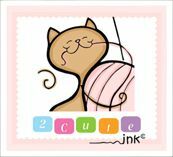 I actually have a few digital stamps that I haven't had a chance to add back in my etsy shop and Sweet Skunkie was one of them. Eventually, I would like to start doing a Throwback Thursday with my old sketches, and start inking them! Wouldn't that be fun? So make sure to grab this little Sweet Skunkie Digi while he is only $2! I am thinking I would like to try and make a line of baby products! I colored up my little elephant design and put him on a bib. I think he looks cute! What do you think?